From the director of The Pirates of the Caribbean comes Rango, featuring Johnny Depp in an original animated comedy-adventure that takes moviegoers for a hilarious and heartfelt walk in the Wild West. 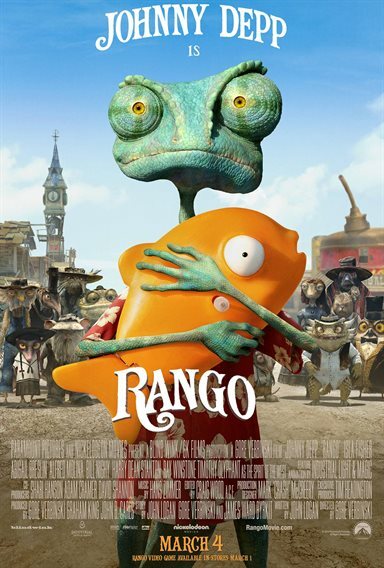 The story ollows the comical, transformative journey of Rango (Depp), a sheltered chameleon living as an ordinary family pet, while facing a major identity crisis. After all, how high can you aim when your whole purpose in life is to blend in? When Rango accidentally winds up in the gritty, gun-slinging town of Dirt - a lawless outpost populated by the desert's most wily and whimsical creatures - the less-than-courageous lizard suddenly finds he stands out. Welcomed as the last hope the town has been waiting for, new Sheriff Rango is forced to play his new role to the hilt . . . until, in a blaze of action-packed situations and encounters with outrageous characters, Rango starts to become the hero he once only pretended to be. With a cast that includes Depp, Isla Fisher,Abigail Breslin, Alfred Molina, Bill Nighy, Harry Dean Stanton, Ray Winstone and Timothy Olyphant as the Spirit of the West, Rango is an exciting new twist on the classic Western legend of the outsider who saves a town - and himself in the process. 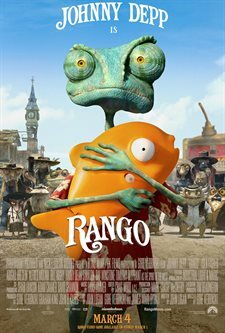 Download Rango in Digital HD from the iTunes store. Rango images are © Paramount Pictures. All Rights Reserved. Pirates of the Caribbean's director, Gore Verbinski (The Ring), has re-teamed with Johnny Depp (Alice in Wonderland, From Hell), and some other of his pirate gang this year to bring audiences around the world, Rango. Rango is a very strange tale of a lizard (Depp), who after spending a very unusual life in a fish tank, ends up in the Mohave Desert. The tale that ensues is a mixture of laughs, humor, and a very bad acid trip. 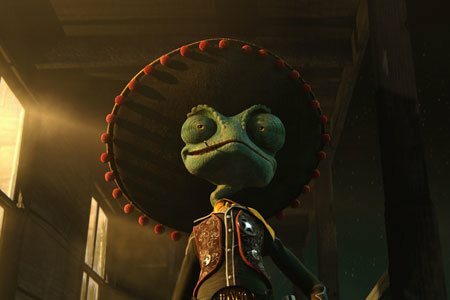 While most adult audiences might dismiss Rango as the latest kid's film from Nickelodeon/Paramount Studios, they would be wiser to look more carefully at this film. In fact, it is quite the opposite; Rango is an adult film taking its cues from films such as, Fear and Loathing in Las Vegas, hiding behind an animated film. 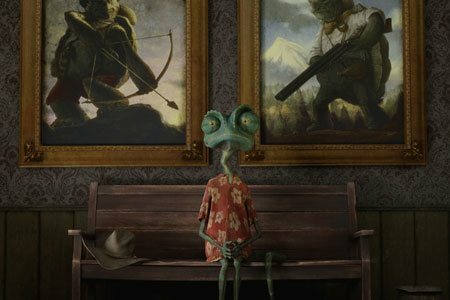 Rango is truly a surreal film with many jokes and situations that will most certainly go above the target audience's heads. The cast of Rango is top notch, and it certainly shines through in the film. Aside from the amazing talent of Johnny Depp, the cast is rounded about by Isla Fisher (Confessions of a Shopaholic), Abigail Breslin (Zombieland), Alfred Molina (Spider-man 2), Bill Nighy (Pirates of the Caribbean), Harry Dean Stanton (Alien), Ray Winstone (The Departed), and Timothy Olyphant (Live Free Die Hard). Some of the voices are very recognizable, e.g. Timothy Olyphant; others such as Alfred Molina simply blend into their character so well that you will not realize who they are until the end credits are rolling. 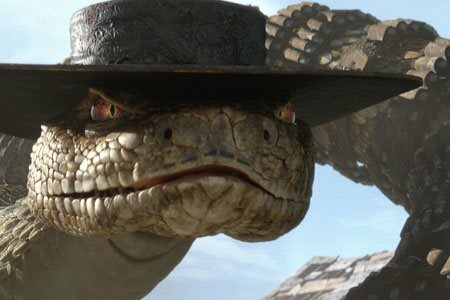 Aside from having an amazing story and cast, Rango also reaches for the stratosphere with its amazing computer animation, created by Industrial Light and Magic. I dare say that it is better than anything Pixar has produced for the silver screen. While the film is not using cutting edge 3D technology, you won't bat an eye that it is missing from the film. Every character is detailed to the last pixel and shines on the screen. 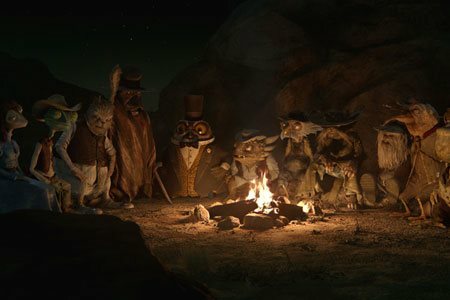 The landscape is perfect in every detail -- the dust of the desert and water are photorealistic; but the special effect that put Rango on the top of computer animated films, is the lighting. The light is so realistic in this animated film thanks to the consulting of cinematographer, Roger Deakins. 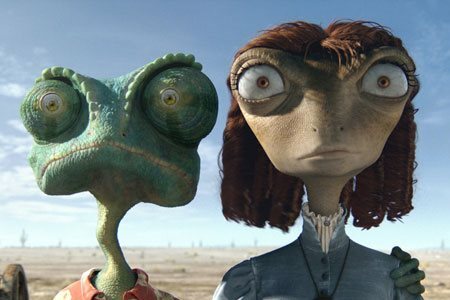 Rango is truly a film for the ages that touches every age of the audience in different ways. Come award's season next year, I have a hard time not believing that this will not win best animated film of the year. If you have some time in the upcoming days, run -- don't walk -- to see this film. 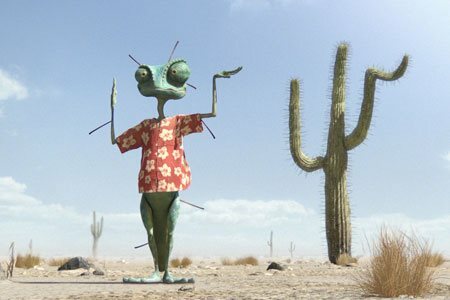 Rango images © Paramount Pictures. All Rights Reserved.